Although most pagans think of this time of year as being a celebration of the first signs of spring - the festival of Imbolc - Candlemas Day, on February 2nd, was traditionally when candles were made and blessed. I love any excuse for lighting candles. Here is a bit of candle magic you can do that not only recycles bits of wax left over from old candles, but also honours the traditions of the wheel of the year. The first thing you need to do is gather up all the candle stubs and bits of wax still clinging to candle holders and votive containers. For this project, I don't think it matters if the candles were originally used for spells or rituals. 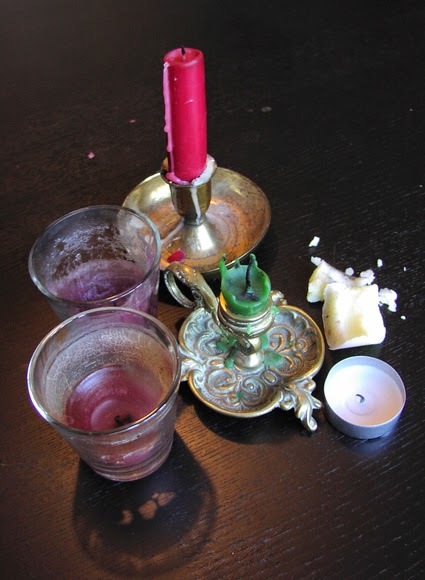 I know some pagans believe that you should always throw out the stubs of candles used for spells and never reuse them, but I think that is wasteful. Much better to use up the leftover wax in a seasonal thank-you rite. You will need to find a container to put the recycled candle in. I reused a votive glass that had been gunked up with old wax - as you can see in the picture to the left. You will also need a new wick - sadly the old ones are not reusable! You can buy pre-stiffened wicks especially for the purpose, and they are great, but I happened to have a roll of ordinary candle wick left over from a previous candle-making effort. Do make sure you get a wick that is the right size for your container - a narrow wick in a large container won't burn well and a thick wick in a tiny container will burn too fiercely. If you are using a unstiffened wick, then you will need to weight it down at the bottom and hang it from something at the top. I reused one of those small metal discs with a hole that you get at the bottom of most tea lights - they are often called "sustainers". Poke the wick through the hole. I then tied the top end of the wick to a chop stick and balanced it over the top of the holder. The old wax will need to be melted. Don't put it into a pan that goes straight onto the cooker. If you are serious candlemaker you can buy a special double-boiler for the purpose, but that really isn't essential unless you want to make lots of candles. You can easily use a general double-boiler saucepan, place a basin inside a pan of boiling water or, as I did, use an old egg-poacher if you only have a small amount of wax. 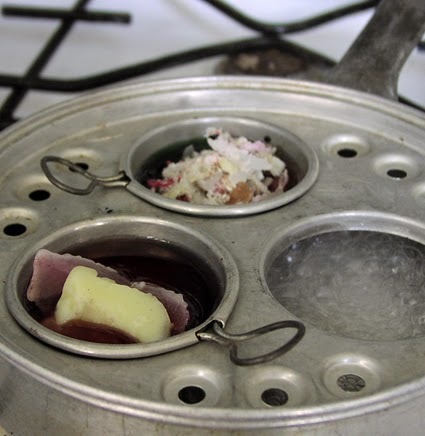 I didn't have a lot of wax to melt and found that two of the little poaching dishes were just the right size for the the wax for one votive candle. 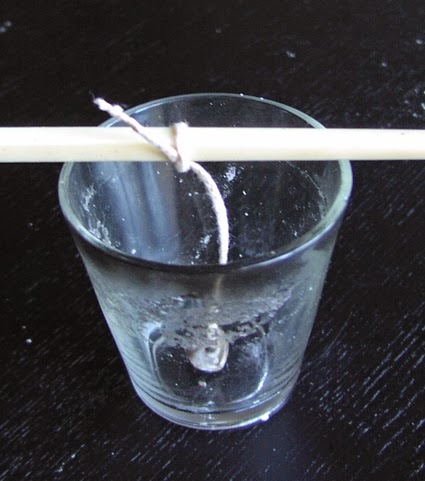 When the wax has melted, first dip the end of your wick with the weight or sustainer into the wax just to coat it, then pop it into the votive holder and let the wax stick stick it to the bottom. You can buy special glue dots to hold the sustainer in place instead of wax, but I've never bothered with these personally. Then carefully pour the rest of the melted wax in around the wick. Leave the candle somewhere to cool down and set - the fridge or a cold windowsill are ideal, although you could just put it straight on a seasonal altar if you have one. 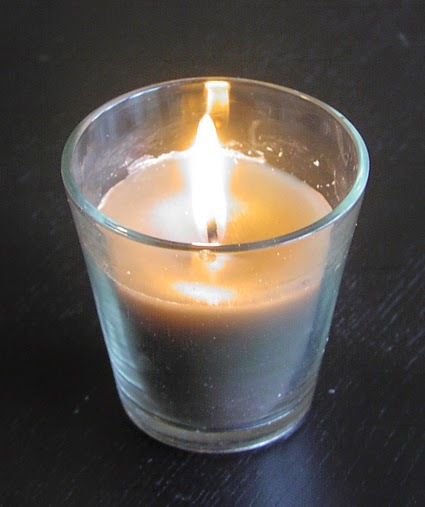 Trim the wick to a sensible length before lighting the candle. The colour will obviously be a mixture of whatever odds and ends of wax went into the melting pot. If you mix lots of colours, it will tend to merge into a grey colour, but that doesn't really matter. If ever there was a grey time of year, this is it. We are more than a month past the longest night, but spring isn't quite here yet. The trees still stand bare and the weather can be bleak, but the darkest time is behind us. A little more light and warmth - symbolised by the candle flame - will soon melt away the greyness. As you light your candle, think back over the winter months that are coming to an end. Give thanks for any gifts and blessings you have received and say goodbye to any hardships you have suffered. Welcome the longer, lighter days that lie ahead. The usual safety rules apply, of course - never leave a lit candle unattended. Great article, and very helpful! Thank you! I had some old blue glass pots that I was keeping 'because one day....' managed to melt one pots' worth. Just put the resulting candle next to my new daffodils and it is burning happily. Thanks - that was fun!